Snap Links, one of our favorite Firefox add-ons of all time, has not been updated for quite some time by its original author. The only way to use it was to rely on third party fixes for the add-on to make it work in later versions of Firefox 2 and Firefox 3. The Firefox add-on provides the means to handle multiple links in the web browser with ease. You use its functionality to draw rectangles on the screen in the browser to perform actions on major or all links that are inside the rectangle. Actions include opening the links in new tabs or windows, bookmarking them, copying them to the clipboard or downloading files they point to. You can configure the drawing to one of the available mouse buttons and even add modifiers to the operation to avoid accidental drawings on the screen. The rectangle is visualized by a green dotted border by default while links that will be opened on release are highlighted in red. 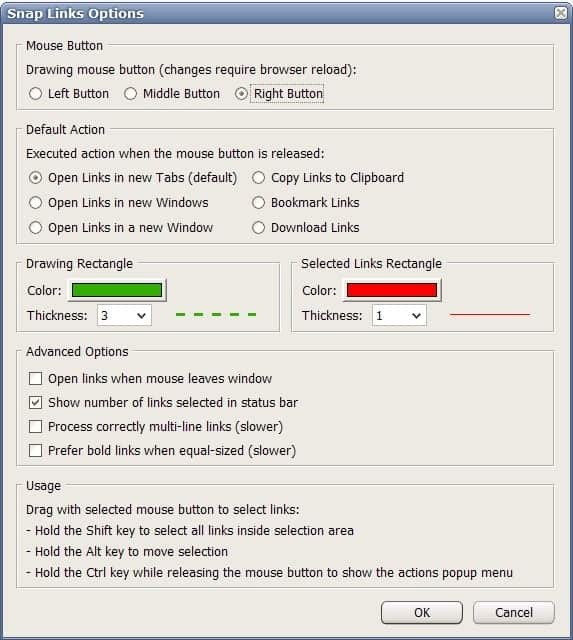 The selected action is executed as soon as you release the mouse button. The good news is that Snap Links finally got updated. It is now available directly from the official Mozilla website (and not Rapidshare or other third party sites like before). The developer has translated the add-on to 17 languages by now which is another bonus. Snap Links is compatible with Firefox 3 including the soon to be released Firefox 3.1. Definitely one of the best add-ons if you regularly work with multiple links that you want to open or download. Update: Snap Links is not compatible with recent versions of the Firefox web browser. We suggest you try Multi Links instead which offers similar functionality and is compatible with all modern versions of the web browser. It supports the same functionality as Snap Links including all configuration options to change the action key and modifiers. i love this add-on, too. Hoi Martin, Thanks for the tip. Do you know maybay somewhere where there is more explenation how to use this program? This because i stil wrestling with the possebilitys. Well you can configure the add-on in the options. I think it uses the right mouse button by default. Just press the right mouse button and keep it press while moving the mouse around. I don’t understand what this add-on could do for me. Well I mainly use it to open all threads (20 per page) in a particular forum at once thus saving 19 clicks and lots of time. Thank you Martin! I finally have a good use for the wheel click! last update is not working!! Would have been good to have a date on the article. Worked for 3.5 – unofficial version – but not for 3.6. Hanging out for an update. I would use this extension more than any other! This works only for a specific version (3.6 in this case). When 3.7 comes out, you would have to manually change the 3.6 to 3.7. Thanks Jojo – firefox lets it run, thinks it is compatible but snaplinks doesn’t work. Good trick though for other extensions people may have.